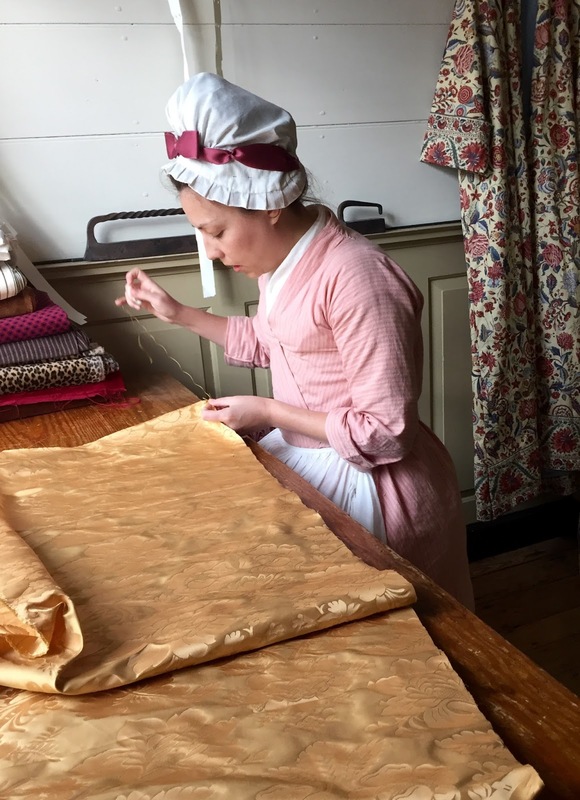 I was very fortunate to be able to spend time recently at the Margaret Hunter Milliners and Mantuamakers at Colonial Williamsburg, watching the construction of a sack back dress (a robe à la française) of gold silk damask. 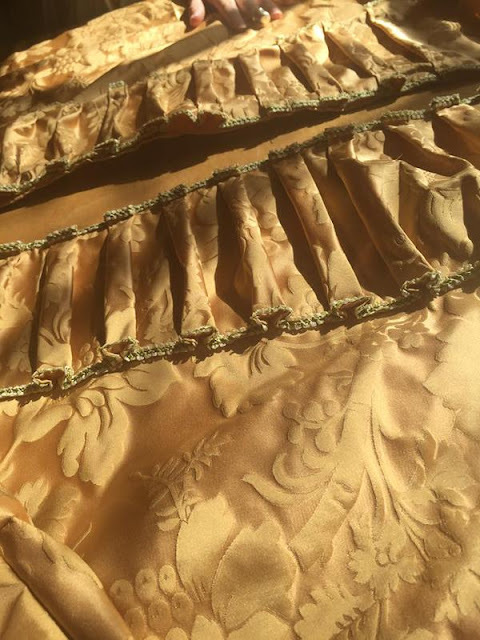 It is based on an original held in the Charleston Museum collections, dating from the mid to late 1760s. To watch the skilled work of the apprentices and journeywoman, under the masterful eye of Mistress Janea, was a true education for me, as well as the dozens of onlookers who packed into the shop. Word had spread quickly that there was a dress being made and visitors were anxious to see the how the “gown in a day” project was proceeding. 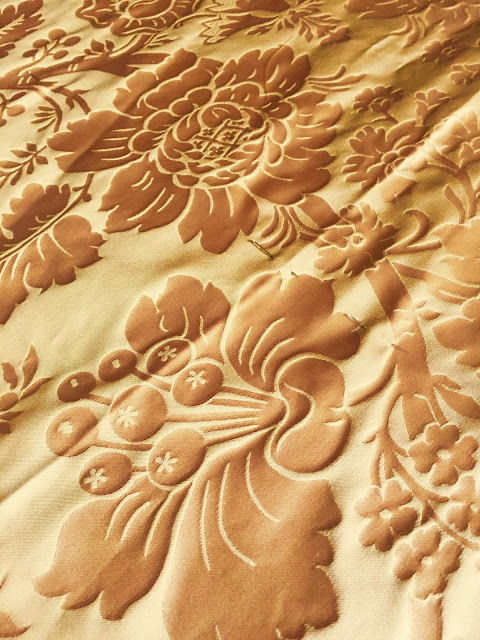 As the first cut was made into this rich buttery yellow gold silk damask, I actually felt a pang of fear – I could not imagine cutting into the textile with such deft certainty. Over the weekend, I observed the first cutting of the fabric, the creation of the sleeves, the extensive pleating which went into the self fabric robings, the mock up of the stomacher, and the sack back (from which the dress derives its name), falling from the neckline and trailing elegantly behind. 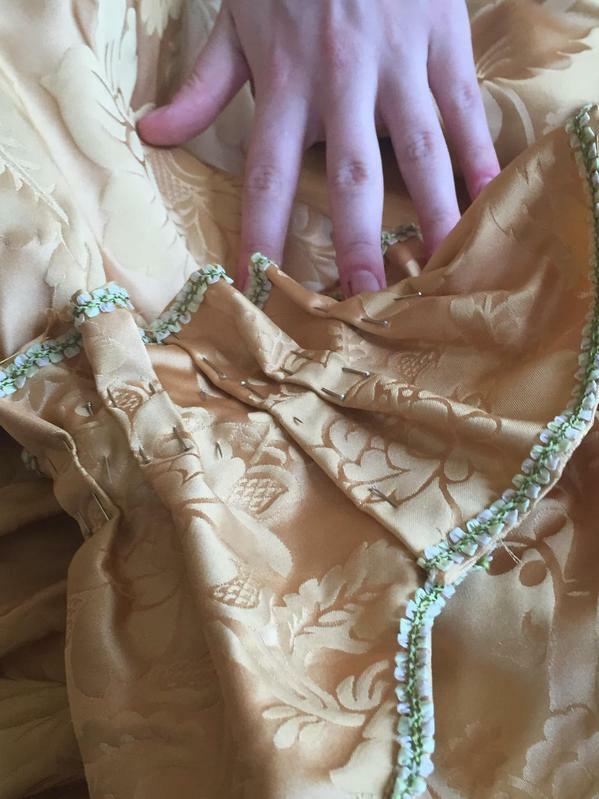 As the dress on which it is based, it is unlined. I spend a good deal of time reading about historic garments, but nothing compares with actually seeing the handwork involved for garnering a deeper understanding. Many thanks everyone at the shop – Janea, Sarah, Abby and two very talented and poised interns, Fiona and Lily -- and to friend and colleague, Susan Holloway Scott of Two Nerdy History Girls (http://twonerdyhistorygirls.blogspot.com) for introducing me to this creative group. I am already planning my next trip!